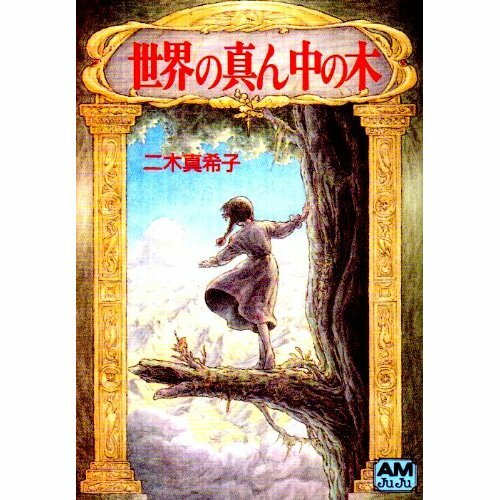 The Tree in the Middle of the World (1989) is a Japanese children’s book by Ghibli animator Makiko Futaki. 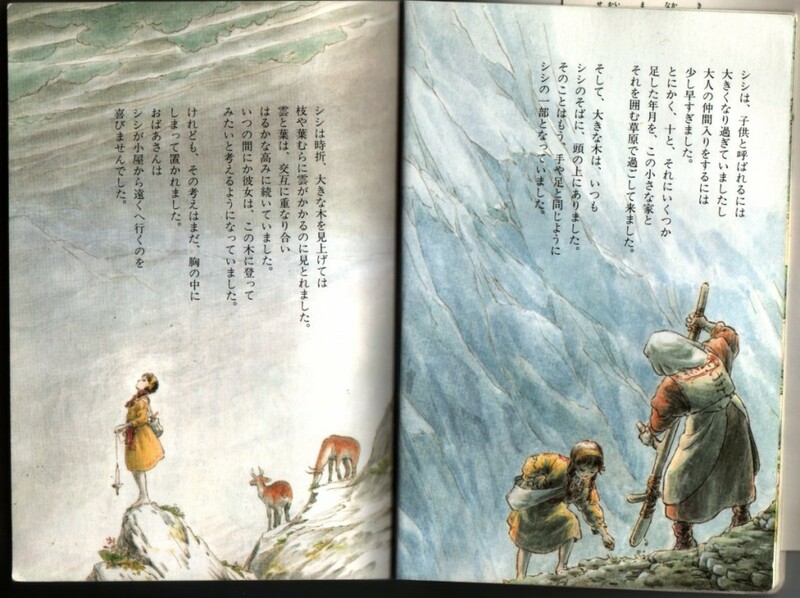 According to the Afterword, Ms. Futaki got the idea for the book while visiting Yakushima to draw great, ancient trees for My Neighbor Totoro, and the idea got stuck in her head of a tree so large it could have animals and people living in it. 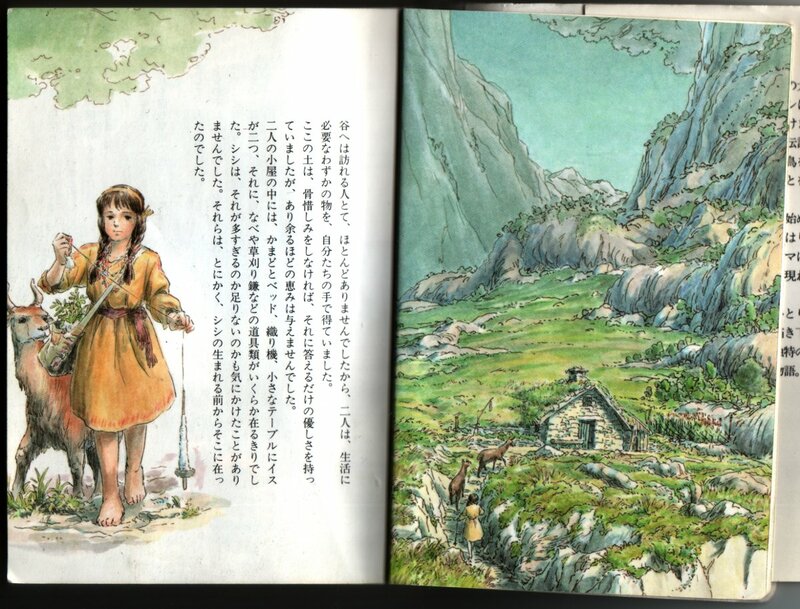 Another afterword is by Hayao Miyazaki. Here are the first six pages of the book. In the middle of the world stands one great tree. Long ago there were a few people who knew about it, but these days, it seems that everyone has forgotten. 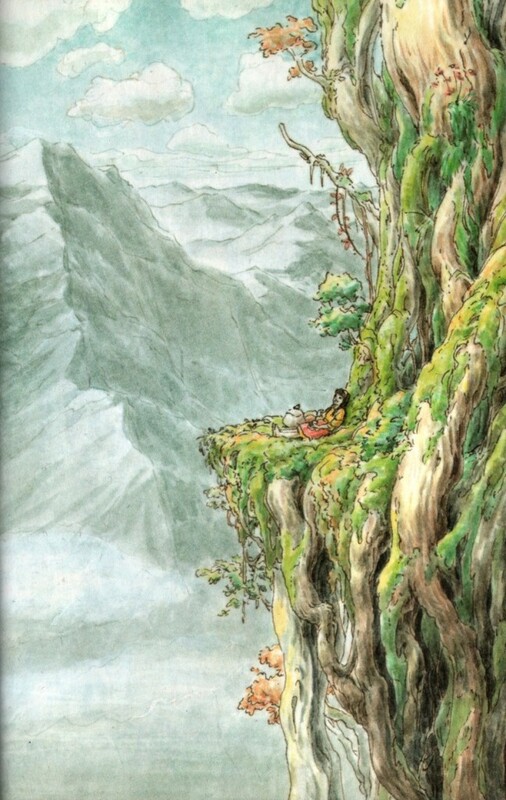 That tree sprung up in a valley encircled by scraggy mountains, and before long overtook the mountains, and grew so, so tall that you couldn’t see the top. The tall trunk split into far-off branches, and bushy leaves billowed out and melted into the clouds. Nobody knew how many hundreds or thousands of years ago the first leaf sprouted on this tree. Over the centuries its surface was covered with countless layers of moss, mistletoe, and sprouts, so much that it was impossible to see the original trunk. In a little cottage at the base of this tree lived a girl named Cici and her grandmother. Because hardly anyone ever came to visit the valley, the two of them made all the necessary things for life with their own hands. The ground here had just enough gentleness to respond as long as you weren’t lazy about it, but it didn’t provide them very much left over. In the cottage they shared, the two of them had a hearth, a bed, a loom, and a little table with two chairs. To the side they kept some tools, like a cooking-pot and a grass sickle. Cici never felt that she had too much or not enough. In any case, that’s the way things had been since before Cici was born. Cici was too large to be called a child, but she was a little too young to be an adult. In any case, she had passed something more than ten years in the little house and the fields around it. 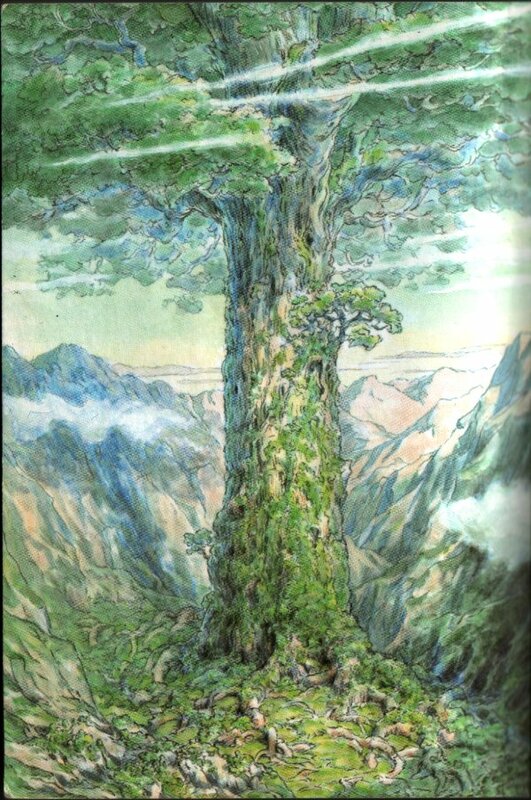 The great tree was always by Cici’s side, rising up above her. It had become a part of Cici, like her hands and feet. Sometimes Cici would look up at the great tree and see patches of branches and leaves intermixed with the clouds above. The clouds and leaves overlapped each other and stretched off into the distance. Before she knew it, she was thinking that she’d like to climb the tree someday. But she kept that thought deep in her heart, because her grandmother would not be happy if Cici went far from the cottage.